Running in a big field of cross country runners can be a little intimidating or even confusing, but it was neither for Ryan Gehman (Millersville, Pa./Lancaster Mennonite) and his teammates. Eastern Mennonite’s senior highlighted the Royals’ great effort by finishing 12th out of 375 runners, as the men placed a very solid 11th at the NCAA D-III Pre-Nationals held Saturday in Mason, Ohio. The EMU women’s cross country team duplicated the men’s performance by taking 11th out of 27 teams at the NCAA D-III Pre-Nationals. 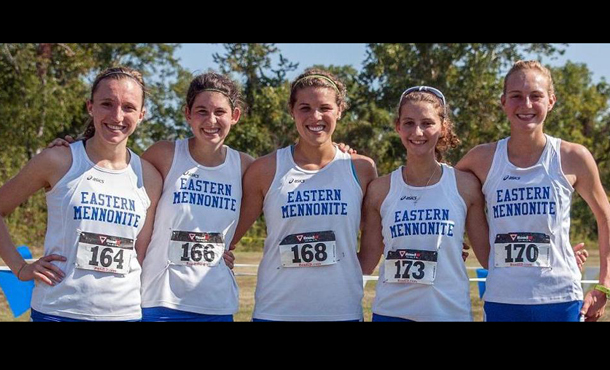 Prior to the pre-national meet, the women’s cross country team finished the Shenandoah Valley Invitational on Sept. 20 with a perfect score, winning the meet, while the EMU men also brought home top honors. Gehman had his best collegiate effort and took nearly 1:17 off his PR in the 8k race, coming in at 24:15.71. His previous best had been 25:32.3 from last year’s regional meet. Fellow senior Jacob Landis (Sterling, Ill./Sterling) was EMU’s number two runner and took 1:24 of his PR. Landis finished 36th at the race with a time of 24:52.01, bettering his PR of 26:17.7, also from the 2013 regional meet. Alec Thibodeaux (Staunton, Va./Fort Defiance) came in 83rd with a time of 25:35.88. Jesse Parker (Wichita, Kan./Wichita East) was 165th in 26:35.25, while Jared Nisly (Lancaster, Pa./Lancaster Mennonite) rounded out the top five in 187th in 26:50.00. Jordan Leaman (Harrisonburg, Va./Harrisonburg) was 200th with a time of 26:57.49 while Tyler Denlinger (Perkasie, Pa./Christopher Dock) clocked at 27:11.07 to come in 213th. Each of EMU’s top seven finishers set their PRs in the race. Lewkowicz said the Royals responded well to the crowded course, which will also host the National Championship Meet on Nov. 22. The Royals totaled 365 points to finish 11th out of 31 teams. They finished in between two South/Southeast Region teams, Bridgewater (356) and Centre (367). North Central (Ill.), the 2013 national runner-up, dominated the race with five of the top six finishers, putting in 16 points for the team title. Troy Kelleher, from North Central, won the individual medal by 18 seconds, finishing in 23:36.28. 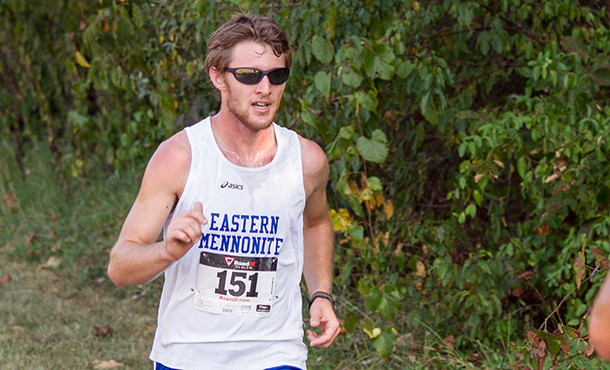 Eastern Mennonite has another break in the schedule before their next meet, the EMU XC Relay Challenge on Oct. 10. Lewkowicz and his staff designed a light-hearted meet, which will feature four-person relay teams, with each runner traversing a two-mile loop on Elk Run Trails in Elkton, Va. The cross country women also ran well on their biggest stage so far this season, duplicating the men’s performance by taking 11th out of 27 teams. The women totaled 319 points. EMU came in behind Hanover (306) but ahead of Waynesburg (328). Geneseo State ran away with the team title with 34 points. They also had the top two runners, with Cassie Goodman winning in 20:54.55. 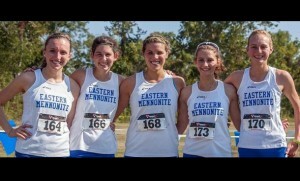 Read more about the women’s cross-country success at pre-nationals.